This postcard shows the boat club on Lake Charles. From the collection of CHPS Board Member, Trent Gremillion, below is a black and white photo of the bridge connecting Shell Beach Drive to Westlake. 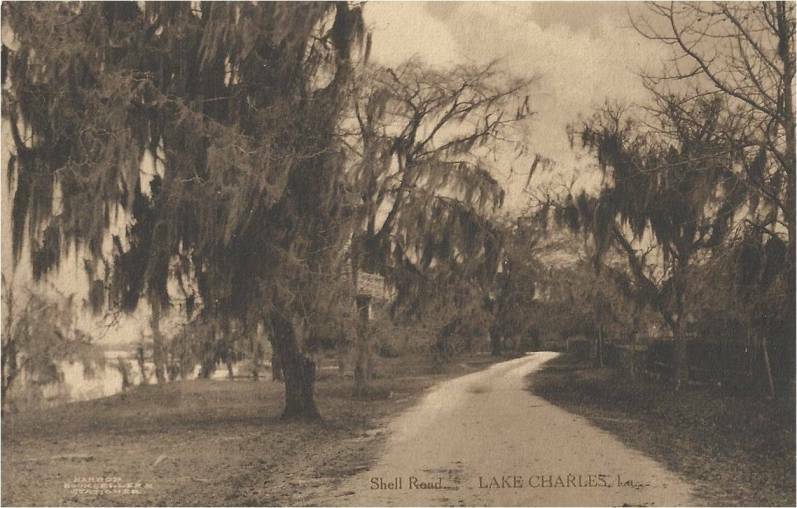 The route for the Old Spanish Trail took a 90-degree left turn onto Front Street (now Lakeshore Drive), crossed the Pithon Coulee Bridge into Margaret Place (then just being developed) and skirted the lake to what was called “the Shell Beach at Walnut Grove,” where the Port of Lake Charles City Docks are now located. This hand-colored postcard was mailed in 1908. An extensive oyster shell midden or mound was located near to where the Lake connected to the lower part of the Calcasieu River at the foot of Shell Beach Drive. This midden not only gave the road and area its name, but was also reportedly the location for several Indian skeletons, pottery and arrowheads. Part of the midden was used to build a shell road eastward to the settlement at Lake Charles. For nearly a half century, this roadway was the primary routing for commerce and transportation cross-continent along the Gulf coast and southern United States. That busy highway is now near forgotten, but the rare beauty of Shell Beach Drive remains. 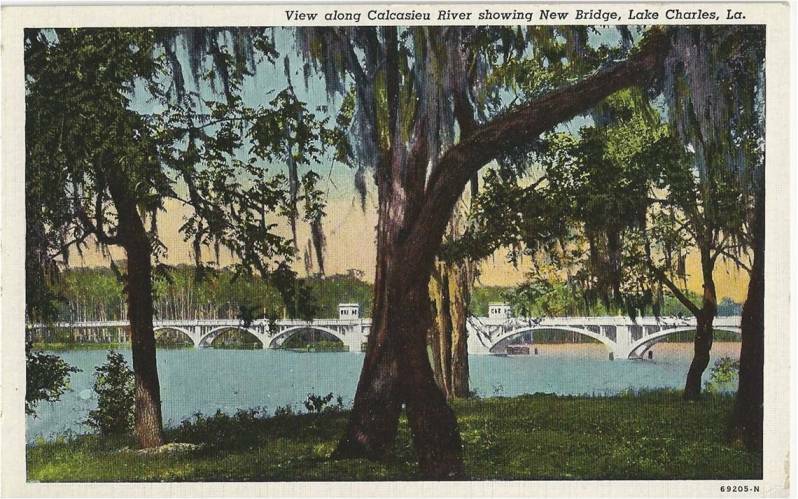 This is one of two postcards showcasing what was then the "new" bridge over the Calcasieu River between Shell Beach Drive and Westlake. Young lady on Shell Beach Drive. In 1888, “Lovers’ Retreat” was completed. This was a long, winding bridge over Pithon Coulee that began at the foot of Front Street and Clarence and ran south and west over a dense cypress swamp. The elevated footpath was built with supports and handrails nailed from tree to tree. On the western end, the footpath connected with the old shell road. The beautiful lake edge street connecting the five houses on this year’s Tour is Shell Beach Drive. It has a long history of use with evidence of having been an ancient American Indian trail long before European settlement. But the heyday of its history was probably that time when Shell Beach Drive formed part of the fabled transcontinental route, the Old Spanish Trail. The Trail was conceived in 1915 as the shortest roadway between the American South and the Pacific Ocean, routed over what would become US Highway 90 and Highway 80. Connecting San Augustine, Florida and San Diego, California, the Old Spanish Trail would pass through some of the South’s and West’s most beautiful, and most treacherous terrain including swamps, massive rivers, and in the West, canyons and deserts. Here in Lake Charles, the route from the east passed over the broad Calcasieu prairie from Jennings. The OST aligned with the southerly transcontinental rail line and curved south and west to form Broad Street, a favored residential street for Michigan Men and other lumber barons. The route took a 90-degree left turn onto Front Street (now Lakeshore Drive), crossed the Pithon Coulee Bridge into Margaret Place (then just being developed) and skirted the lake to what was called “the Shell Beach at Walnut Grove,” where the Port of Lake Charles City Docks are now located. times daily.) The Trail traveled on through Westlake, and on to Texas and the Pacific.